This is a Chinese name; the family name is Han. 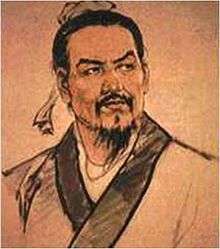 Han Fei (traditional Chinese: 韓非; simplified Chinese: 韩非; pinyin: Hán Fēi; c. 280 – 233 BC), also known as Han Fei Zi, was an influential political philosopher of the Warring States period "Chinese Legalist" school. He synthesized the methods of his predecessors, as described in his eponymous work, the Han Feizi. He is considered to be the greatest representative of Chinese Legalism, his work Han Feizi consisting of the combination of the core Legalist principles. His writings were very influential on the future first emperor of China, Qin Shi Huang. After the early demise of the Qin Dynasty Han's philosophy was officially vilified by the following Han Dynasty. Despite its outcast status throughout the history of imperial China, his political theory continued to heavily influence every dynasty thereafter, and the Confucian ideal of a rule without laws was never again realized. Shu Han's chancellor Zhuge Liang demanded emperor Liu Shan read the Han Feizi for learning the way of ruling. Han borrowed Shang Yang's emphasis on laws, Shen Buhai's emphasis on administrative technique, and Shen Dao's ideas on authority and prophecy, emphasizing that the autocrat will be able to achieve firm control over the state with the mastering of his predecessors methodologies: his position of power (勢, Shì); technique (術, Shù), and law (法, Fǎ). Han Fei ("Hahn" "Fay") is his name, while -Zi (子, lit. "Master") was often added to philosophers' names as an honorific. The title Han Feizi is also used to denote the book written by him. Unlike the other famed philosophers of the time, Han Fei was a member of the ruling aristocracy, having been born into the ruling family of the state of Han during the end phase of the Warring States period. In this context, his works have been interpreted by some scholars as being directed to his cousin, the King of Han. He studied together with future Qin chancellor Li Si under the "Realist" Confucian philosopher Xunzi. It is said that because of his stutter, Han Fei could not properly present his ideas in court. His advice otherwise being ignored, but observing the slow decline of his Han state, he developed "one of the most brilliant (writing) styles in ancient China." Sima Qian’s biography of Han Fei is as follows: "Han Fei was a prince of Han, in favor of the study of name/form and law/art which takes its root in the Huang-Lao philosophy. He was born a stutterer and was not able to dispute well, but he was good at writing papers. Together with his friend, Li Si, he served Xun Qing, and Si himself admitted that he was not as competent as Fei. Seeing Han was on the decline, he often remonstrated with the king of Han by submitting papers, but the king did not agree to employ him. At this, Han Fei was frustrated with the reality that, in governing a state, the king did not endeavor to refine and clarify the juridical system of the state, to control his subjects by taking over power, to enhance state property and defense, or to call and employ the wise by enhancing the state. Rather, the king employed the corrupted and treacherous and put them in higher positions over the wise. He regarded the intellectuals as a disturbance to the Law by employing their literature, and thought that knights violate the prohibition of the state by using armed forces. While the state was in peace, the king liked to patronize the honored; while in need, he employed warriors with armor and helmet. So the cultivated men could not be employed and the men employed could not be cultivated. Severely distressed over the reality that men of high integrity and uprightness were not embraced by the subjects with immorality and corruption, he observed the changes in the gaining and losing of the past. Therefore, he wrote several papers like Gu Fen, Wu Tan, Nei-Wai Chu, Shou Lin, and Shei Nan, which amount to one hundred thousand words. However, while Han Fei himself knew well of the difficulty of persuasion and created the detailed writing, Shei Nan, he eventually killed himself at Qin. He could not escape the trap of words for himself." His works ultimately ended up in the hands of the thrilled Qin king. Qin king commented "If I can make friend with this person (Han Fei), I may die without regrets." and invited Han Fei to Qin. Han Fei presented the essay "Preserving the Han" to ask Qin king not to attack his homeland, but his ex-friend and rival Li Si - who were jealous of Han Fei - used that essay to convinced to imprison Han Fei on account of his likely loyalty to Han. Han Fei responded by writing another essay named "In the first time of meeting Qin king", hoped to use his writing talent to win the king's heart. Han Fei did win the king's heart, but not before Li Si forced him to commit suicide by drinking poison. The Qin king later regretted about the unfortunate death of Han Fei. Xunzi formed the hypothesis that human nature is evil, virtueless and suggested human infants must be brought to their virtuous form through social-class-oriented Confucian moral education. Without such, Xunzi argued, man would act virtuelessly and be steered by his own human nature to commit immoral acts. Han Fei's education and life experience during the Warring States period, and in his own Han state, contributed his synthesis of a philosophy for the management of an amoral and interest-driven administration, to which morality seemed a loose and inefficient tool. Han agreed with his teacher's theory of "virtueless by birth", but as in previous Legalist philosophy, pragmatically proposed to steer people by their own interest-driven nature. ^ Watson, Burton, Han Fei Tzu: Basic Writings. 1964, p. 2. The king in question is believed to be either King An (238–230 BC) or his predecessor, King Huanhui (272–239 BC). Burton Watson (1964). Han Fei Tzu: Basic Writings. New York: Columbia University Press. ISBN 978-0-231-08609-7. Li, Guangcan, "Han Fei Quotes". Encyclopedia of China (Law Edition), 1st ed. Gu, Fang, "Han Fei Life Quotes". Encyclopedia of China (Philosophy Edition), 1st ed.